How actionable is your marketing data and analytics? Are you drawing the proper insights in a timely matter and developing the appropriate marketing strategies and tactics? Are these strategies generating new opportunities, cultivating existing customers, or otherwise getting people to love your brand? The “do-it-for-me” (DIFM) analytics tool market is evolving, with new capabilities including AI-powered and predictive analytics. Marketing and CX buyers should get a fresh look at the key benefits this category has to offer. 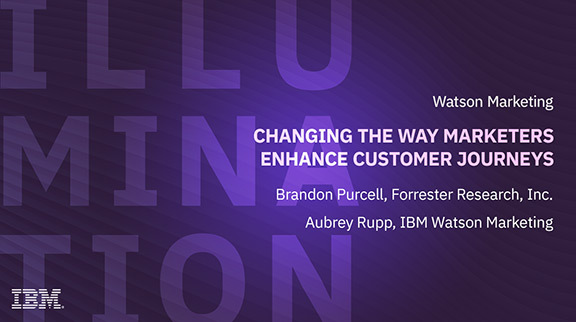 Please join Aubrey Rupp, Offering Manager, Watson Customer Experience Analytics, IBM Watson Customer Engagement and our guest, Brandon Purcell, Principal Analyst Serving Customer Insights Professionals at Forrester Research, as they help marketers and CX professionals understand technology capabilities, market trends, use cases and the evolving role of the insight-driven marketer.